Welcome to the homepage for the Center for Research on Emotion, Stress, and Technology at the University of Vermont. We are an interdisciplinary team who conducts research on traumatic stress. Our main objective is to find ways to reduce the distress many experience after a trauma and prevent chronic suffering. To achieve this challenging goal, we integrate methods from psychology, neuroscience, computer science, and robotics. We are always interested in meeting new motivated team members with an interest in psychology, computer science, or a related field. Our team is actively involved in research, clinical work, and related activities to help those who have experienced a trauma. Here are some of our recent accomplishments! 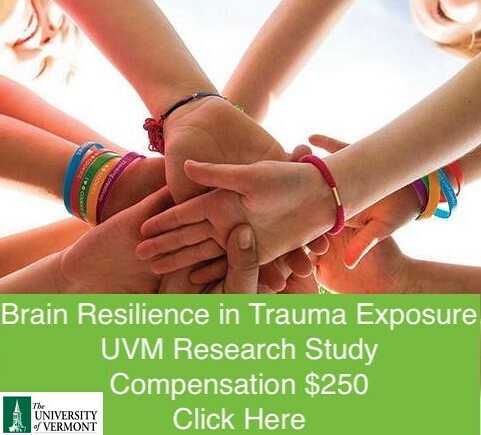 7.11.18: Participate in the BRITE (Brain Resilience in Trauma Exposure) Study! 5.18.18: Congratulations to all the UVM graduates this year. We wish you all the best and much continued success! 5.1.18: Congratulations to Rebecca Mirhashem on the receipt of the Donald G. Forgays Outstanding Senior Award in Psychological Science! 5.1.18: Congratulations to Julie Connor on the receipt of the Bruce S. Kapp award in Neuroscience! 4.30.18: Congratulations on our new publication with colleagues at the Medical University of South Carolina: Prior interpersonal violence exposure and experiences during and after a disaster as predictors of posttraumatic stress disorder and depression among adolescent victims of the spring 2011 tornadoes. 4.9.18: Congratulations to Ally Legrand on the successful proposal of her 2nd Year Project! 3.21.18: Congratulations to lab alum Holley C. Allen for her acceptance to a clinical psychology PhD program! 3.26.18: Congratulations to Cassie van Stolk-Cooke on a successful defense of her 2nd Year Project! 3.26.18: Congratulations to Julie Connor on a successful defense of her Honor's Thesis! 3.9.18: Congratulations to Rebecca Mirhashem on a successful defense of her Honor's Thesis! 3.4.18: Congratulations to Dr. Price on the funding of a grant from the UVM Dean's Office to evaluate Mindfulness Mediation as an intervention for PTSD. Stay tuned for more details! 3.4.18: Congratulations to Bethany Harris on her receipt of an APLE award to conduct a study on how the timing of trauma exposure may influence PTSD development. 1.16.18: Welcome back to the spring semester! Check out our past accomplishments and photos in our Archive.